India is the vast Populated and Amazing, Beautiful, fastest Growing Country Of the World.Many famous person born to India. And many amazing, beautiful place have India.Today We Know About Some Interesting Unknown facts about India. 1.Around a 100 million years ago, India was an island. Mawsynram, a place on the Khasi Hills, Meghalaya, receives the highest recorded average rainfall in the world. Cherrapunji, also a part of Meghalaya, holds the record for the most rainfall in the calendar year of 1861. 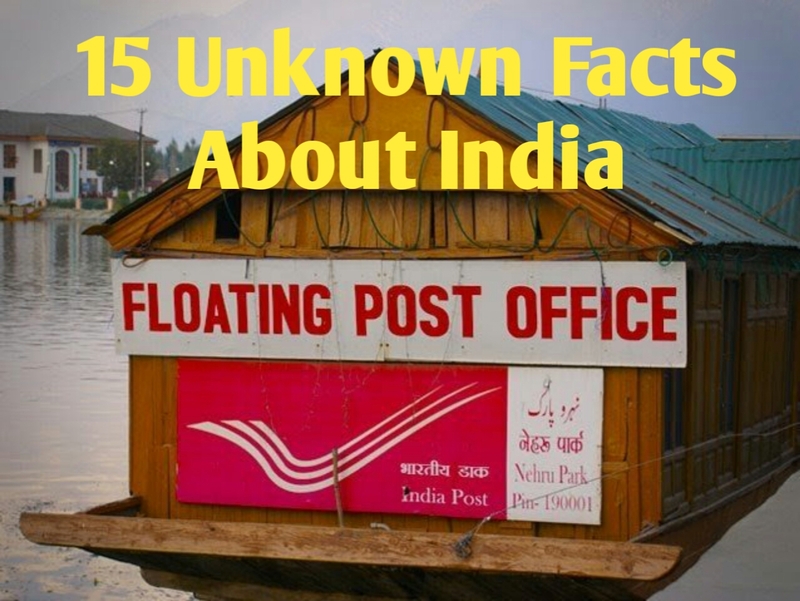 India has the largest postal network in the world with over 1, 55,015 post offices. The floating post office in Dal Lake, Srinagar, was inaugurated in August 2011. On Of The Biggest Mela on West Bengal, India. in 2011 Kumbh Mela was the largest gathering of people with over 75 million pilgrims. The gathering was so huge that the crowd was visible from space. It took a total of 2,57,00,000 man hours for completion and also weighs as much as 50,000 African elephants. The highest Cricket Ground is situated in India.At an altitude of 2,444 meters, the Chail Cricket Ground in Chail, Himachal Pradesh, is the highest in the world. It was built in 1893. One time Kabaddi is national game of India.India has won all 5 men's Kabaddi World Cups held till now and have been undefeated throughout these tournaments. The Indian women's team has also won all Kabaddi World Cups held till date. India's ISRO Chandrayaan- 1 using its Moon Mineralogy Mapper detected water on the moon for the first time in september 2009. The father of India's missile programme had visited Switzerland back in 2006. Upon his arrival, Switzerland declared May 26th as Science Day. When Dr Rajendra Prasad was appointed the President of India, he only took 50% of his salary, claiming he did not require more than that. Towards the end of his 12-year tenure he only took 25% of his salary. The salary of the President was Rs 10,000 back then. After defeating Germany 8-1 in the 1936 Berlin Olympics, Major Dhyan Chand, the wizard of hockey, was summoned by Hitler. He was promised German citizenship, a high post in the German military and the chance to play for the German national side. Dhyan Chand however declined the offer. 13. Takshila is said to be the first every university in the world; it started around 700 BC. 14. Today, India has the world’s largest school in terms of students, the City Montessori School in Lucknow. It has more than 45 thousand students! 15. Indian Railways employs more than 1.3 million people. That’s more than the population of many nations.